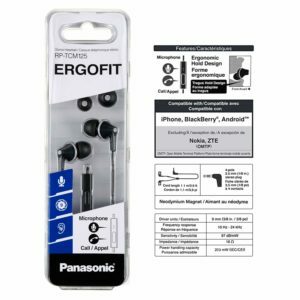 PANASONIC ErgoFit Earbud Headphones with Microphone and Call Controller in Black color is now available at Amazon.com for just $10.00 (REG $19.99) (As of 25 January 2019, 9:15 PST – Details) with $9.99 (50%) Savings. 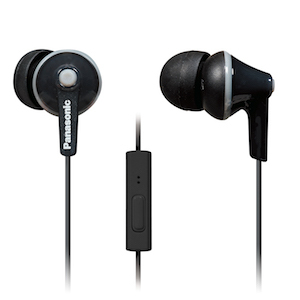 The Panasonic RP-TCM125 ErgoFit Earbud Headphones with Microphone and Call Controller are the perfect combination of style, comfort, functionality and most of all, high-quality sound. 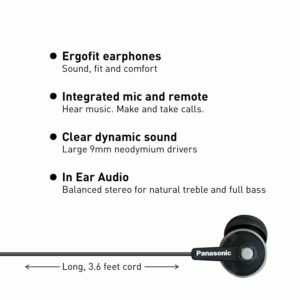 The In-line microphone on the cord of earbud headphones is used for answering calls or voice commands; Compatible with iPhone, Android and Blackberry*. 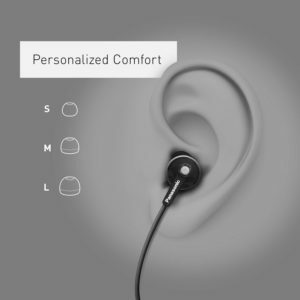 Earbuds with three sets of earpads (S/M/L included), provide a custom, comfortable ergonomic fit that won’t slip out. Choose from five (5) vivid color options with color-matching earbuds, headphone cord and call controller to best complement your personal style and mood.